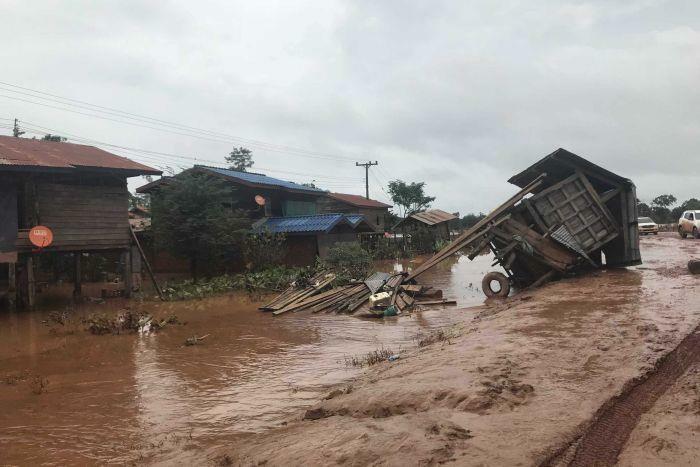 VIENTIANE, Jan. 29 (Xinhua) -- Some 710,000 U.S. dollars has been paid to the families of 71 people who died or are still missing after an auxiliary dam collapsed in Sanamxay district, some 560 km southeast of Lao capital Vientiane, local daily Vientiane Times reported on Tuesday. The 71 victims of the July 2018 tragedy comprise 22 missing people and 49 who were confirmed dead. Their families were offered 10,000 U.S. dollars for each victim, following an announcement issued by Lao Prime Minister's Office. The announcement, issued on Jan. 23, instructed Lao provincial authorities, an insurance company, and the Xe-Pian Xe-Namnoy Power Co., Ltd. to disburse the compensation payments to the victims' families in line with the relevant laws and insurance policy, said the report. The governor of Sanamxay district Bounhom Phommasane as quoted by the Vientiane Times as saying that the money was handed over to the victims' families on Saturday. The collapse of the dam at the Xe-Pian Xe-Namnoy hydropower plant caused a massive flash flood that wiped out several villages downstream, leaving more than 4,000 people homeless. Many other villages and their inhabitants were also affected. Bounhom said the relevant sectors were speeding up work to complete temporary housing this month, adding that the worst-affected people had already moved into newly-built houses. The government is also working with the project developers to build permanent communities in new locations to accommodate the thousands who were made homeless. Five devastated villages were no longer suitable for habitation and were at risk of suffering from similar incidents in the future. Other villages have been restored to a habitable state and the residents have returned. "We have prepared land on which to build the new houses and the area has been cleared," Bounhom said. Lao provincial authorities and Lao Ministry of Public Works and Transport are finalizing town planning for the new communities. It is estimated that construction of the new houses will take about three years to complete, said the report. Lao government and the project developers will work together to figure out their responsibility for the disaster, including compensation for losses, restoration of damaged property, and rebuilding. The project developers have provided assistance in cash and in kind to help with recovery and rebuilding.